Of all the 19th century composers after Beethoven and Schubert, only Brahms matched Dvoř�k�s commitment and achievement in chamber music. And of course Brahms was Dvoř�k�s mentor, the greatest artistic influence on his life. 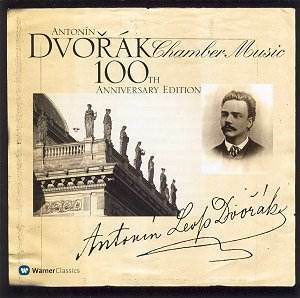 This 6CD set is one of three that Warner Classics has issued in order to commemorate the centenary of Dvoř�k�s death. (The others feature symphonies and symphonic poems, and concertos, serenades and the Requiem.) All three sets have an arbitrary collection of music within the scope of their chosen themes; but they are still substantial and useful contributions to the Dvoř�k catalogue, restoring the presence of some significant performances. To concentrate on this issue as far as these chamber music discs are concerned, practically all the important compositions are included. The major omissions, and both are to be regretted, are the A flat major String Quartet, Opus 105, and the C major, Opus 61. That caveat acknowledged, let us give thanks for what we have. Dvoř�k composed in all the central chamber music combinations, and the first two of these discs are given over to his four piano trios. For all the fame and popularity of the Dumky Trio, and it is undoubtedly a fine piece, the jewel in the crown among these piano trios is surely the F minor, Opus 65, for its reconciliation of form and emotionally driven content. The Trio Fontenay have its measure, as they do with the other trios recorded here, but there is more passion in the music than they find. Not that this is a major problem; in fact it is more a matter of interpretation, and artists of this calibre will always bring their own views to bear upon the music they perform. Moreover a masterpiece of music will always be greater than any one performance of it. Therefore the Fontenay performance, clearly and atmospherically recorded, adds to our understanding of this marvellous music. In the Dumky Trio the performers bring a unifying control to the complex formal design, and in many respects this has to be the priority in this music that moves from one tempo to another so swiftly, like a �stream of consciousness� ebb and flow. The disc has individual cue points for each turn in the six movement span, and the information is admirably clear in the booklet. The latter also has the benefit of a well planned set of notes by Patrick Lambert, doyen of British commentators on the Czech repertoire. The Keller Quartet perform the two chamber pieces from the American years: the Quartet, Opus 96 and the Quintet, Opus 97. The first of these is one of the composer�s most tuneful and masterly scores, exuding the warmth of his musical personality, and the players bring a sensitive response to its glories. The Quintet, with its added viola, is a more complex work and in my view the greatest among Dvoř�k�s �New World� compositions. Just listen to the opening phase of the first movement, at once enigmatic and clearly designed, to realize how high are the standards of inspiration allied to technique. Of course the Keller Quartet, joined by Anna Deeva, have the music�s measure, but the recorded sound has too little bloom to allow the warmth of the quintet textures to make their full effect. In this regard the recent Naxos issue with the Vlach Quartet and Ladislav Kyselák (8.553376, coupled with the Quintet, Opus 1) is to be preferred, though the discerning enthusiast should acquire both in order to gain maximum satisfaction. Disc 3 also has the bonus of five of the song arrangements for string quartet, known as The Cypresses, skillfully played by the New Helsinki Quartet, and offered in perhaps the best recorded sound among these collected performances. The two string quartets from the 1870s, Opus 34 and Opus 51, are played by the American String Quartet. Here the sound is somewhat brighter, and the assured quality of the playing is such that it makes the whole enterprise seem absolutely right for the music. During these years Dvoř�k was discovered as a major voice, and he gained in creative assurance as a result. Therefore these two quartets are an important part of that awakening of his potential. Opus 51, for example, was commissioned with a deliberate intent to generate a distinctively Czech chamber music; and Dvoř�k succeeded fully in taking up the cause. For this is one of his most effectively tuneful pieces, while the finale is as vivacious as anything in the quartet literature after Haydn. The Sextet, Opus 48 is another example of a masterpiece that is not as well known as it might be. Inspired by the example of his mentor Brahms, Dvoř�k composed a substantial four-movement piece combining features of the Viennese inheritance and the Czech style. For example, the elegiac slow movement is a Dumka, the fast scherzo a Furiant, while the finale is one of the strongest variation movements he ever composed. The performers are the Boston Symphony Chamber Players. Who give us a firm reminder that the world�s great orchestras contain players of the highest calibre. In the final String Quartet, Opus 106, the celebrated Alban Berg Quartet not only perform with due accuracy and intonation, they also bring a powerful emotional commitment to this major work from the mid 1890s, when Dvoř�k returned to Europe. The extended slow movement is particularly eloquent, while the contrast of slow introduction and fiery Allegro makes for a potent finale. The final disc (CD6) returns to the combination of piano and strings, with the great Piano Quintet, Opus 81 and the finest of the Piano Quartets, Opus 87. The Quintet is another of those pieces whose personality and material straddles the Viennese tradition and Czech nationalism, and the varied approach is felt from the very beginning , when one of the most ingratiating of themes is soon contradicted by a burning intensity and drama. Holding the volatile mixture together is a challenge, but András Schiff and the Panocha Quartet rise to it with the utmost assurance. Likewise in the E flat major Piano Quartet these artists have a confident command of the music, and shape its contours with feeling and purpose. The performance makes a suitably impressive conclusion to this excellent collection of chamber music by this Czech master.